Nike Yardline at Champs Sports opens first-ever retail experience designed to serve football athletes from pee-wee to pro. When Nike secured exclusive NFL licensing rights nearly two years ago, we knew to expect unique gridiron ventures from the world's leader in sportswear apparel. 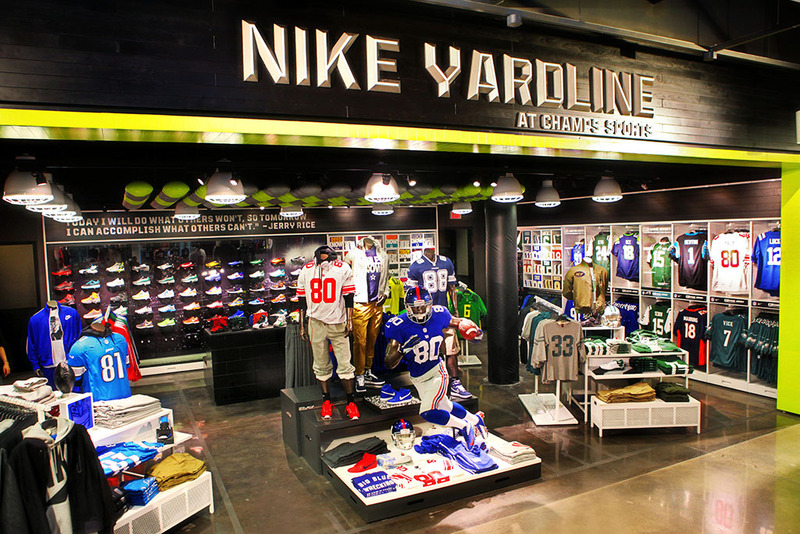 Having already made a huge splash with uniform unveilings and product releases, Nike announces their their next NFL-oriented move, a collaborative retail space with Champs Sports called Yardline. Nike Yardline is the first ever mall-based retail destination, offering a complete experience to athletes and those who live a football life. The store is located in Willowbrook Mall in Wayne, New Jersey and will provide customers with access to signature Nike football products, athletes, teams and experiences while connecting the location and national football community both in store and online. Nike and Champs plan to expand and evolve Yardline locations in the future. The digital experience is carried over to champssports.com/yardline. Today's Grand Opening event showcased new NFL Nike “Limited” Jerseys, 32 team “Knows” tees and limited player edition product such as the latest Nike TR1 colorways including Jerry Rice, Tim Tebow and Calvin Johnson. Several New York Giants, including wide receiver Hakeem Nicks, were in attendance.